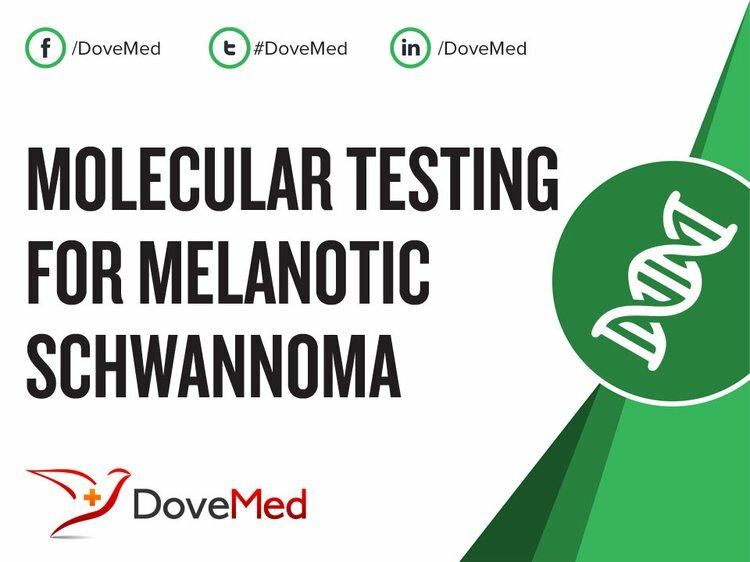 Molecular Testing for Melanotic Schwannoma is a genetic test that is helpful in aiding a diagnosis of melanotic schwannoma. The cause of melanotic schwannoma is due to genetic mutations. The methodology used for melanotic schwannoma may vary from one laboratory to another. What are the Clinical Indications for performing the Molecular Testing for Melanotic Schwannoma Test? How is the Specimen Collected for Molecular Testing for Melanotic Schwannoma? What is the Significance of the Molecular Testing for Melanotic Schwannoma Result? Stratakis, C. A., Kirschner, L. S., & Carney, J. A. (2001). Clinical and molecular features of the Carney complex: diagnostic criteria and recommendations for patient evaluation. The Journal of Clinical Endocrinology & Metabolism, 86(9), 4041-4046. Torres-Mora, J., Dry, S., Li, X., Binder, S., Amin, M., & Folpe, A. L. (2014). Malignant melanotic schwannian tumor: a clinicopathologic, immunohistochemical, and gene expression profiling study of 40 cases, with a proposal for the reclassification of “melanotic schwannoma”. The American journal of surgical pathology, 38(1), 94-105. Küsters-Vandevelde, H. V., van Engen-van Grunsven, I. A., Küsters, B., van Dijk, M. R., Groenen, P. J., Wesseling, P., & Blokx, W. A. (2010). Improved discrimination of melanotic schwannoma from melanocytic lesions by combined morphological and GNAQ mutational analysis. Acta neuropathologica, 120(6), 755-764. De Cerchio, L., Contratti, F., & Fraioli, M. F. (2006). Dorsal dumb-bell melanotic schwannoma operated on by posterior and anterior approach: case report and a review of the literature. European Spine Journal, 15(5), 664-669. Conti, P., Pansini, G., Mouchaty, H., Capuano, C., & Conti, R. (2004). Spinal neurinomas: retrospective analysis and long-term outcome of 179 consecutively operated cases and review of the literature. Surgical neurology, 61(1), 34-43. Carrasco, C. A., Rojas-Salazar, D., Chiorino, R., Venega, J. C., & Wohllk, N. (2006). Melanotic nonpsammomatous trigeminal schwannoma as the first manifestation of Carney complex: case report. Neurosurgery, 59(6), E1334. Kirschner, L. S., Carney, J. A., Pack, S. D., Taymans, S. E., Giatzakis, C., Cho-Chung, Y. S., & Stratakis, C. A. (2000). Mutations of the gene encoding the protein kinase A type I-α regulatory subunit in patients with the Carney complex. Nature genetics, 26(1), 89-92. Groussin, L., Kirschner, L. S., Vincent-Dejean, C., Perlemoine, K., Jullian, E., Delemer, B., ... & Bertagna, X. (2002). Molecular analysis of the cyclic AMP-dependent protein kinase A (PKA) regulatory subunit 1A (PRKAR1A) gene in patients with Carney complex and primary pigmented nodular adrenocortical disease (PPNAD) reveals novel mutations and clues for pathophysiology: augmented PKA signaling is associated with adrenal tumorigenesis in PPNAD. The American Journal of Human Genetics, 71(6), 1433-1442.